« Is Sicily the California of Italy, or Is California the Sicily of the United States? GO ICE-T! u nailed it! we need to be able to protect ourselves.. not ‘trust’ the gov to protect us POSSIBLY FROM THEM lol.. thats just stupid of them to suggest they be the protectors of ‘we the people’! Like letting the wolves protect the sheep. It just does not ever make any sense. The gov tries to tell us we will be safer from criminals. now come on, criminals do not follow any rules. Its just the silliest reason ever. We need em for just what you said.. to protect ourselves from a tyrannical gov trying to harm the people. period. Blacks have their own reasons to distrust government, and they are reasons that don’t jive with why conservatives distrust government. But, the great thing about the 2nd Amendment is the it doesn’t care what our reasons are to feel a need to protect ourselves against the government. It just is, and it’s purpose is for us to secure our persons and property against the government. You’ll notice that even though he feels that the government is worthy of distrust, as do I if for different reasons, neither of us is out of the street fomenting armend rebellion. However, should that day arise when it becomes necessary. We can both be there because of the 2nd Amendment. Go, Ice-T! At the bottom of it all, we recognize a common need to protect ourselves from government, and for that I salute you. Ice-T is my new hero! I’ve always liked him, but now I love him! Uh, Tracy Morrow, A.K.A. 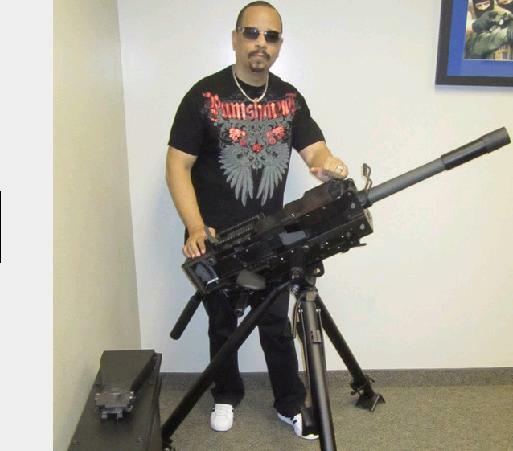 Ice-T, spent less than 4 years in the army, some of it in jail. He made only E-3. You don’t become Ranger Batt in less than 4 years. He plays a cop on TV. He played a gangsta rapper in the recording studio. The only gang I know of him actually being in wore OD green and camo. And had a tab on the shoulder that said ‘Ranger’. Believe it or not: In a previous existence, Ice-T was a US Army airborne ranger. Maybe he sang Cop Killer but he plays a cop on TV. He’s critical of the country but seems disinclined to hop a boat to Africa or elsewhere. Call that “below” critical, or “hypo” critical. Now if he could just raise his sights to include the risk that the country faces from the HSA with its ignoring of the 4th amendment, and its 420 million rounds of hollowpoint ammo that are not allowed to be used in war and are not used for practice, which just leaves Americans as a target. Indeed. That caught my ear too. Is he a mere passenger? Let him be among the first to relinquish his claims to any of that land and it’s fruits. Dan, I agree that most of his comments in defense of gun ownership are admirable. However, listen to his last comment in the video about “never having justice on stolen land.” That’s a bit disturbing.